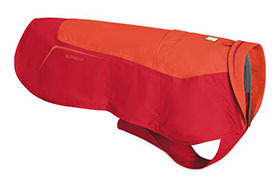 The Ruffwear Vert is waterproof, windproof and breathable dog jacket - more than a raincoat. This coat was designed for winter conditions. The Vert offers protection from harsh weather and it's cozy fleece lining keeps your pet warm during work and play. Leg loops can be used to keep the jacket in place during bad weather. The leash portal allows the Vert to be worn over most harnesses. Fold up the oversized storm collar for maximum weather protection. Cleaning: Secure fasteners, cold wash, gentle mild detergent, hang dry.